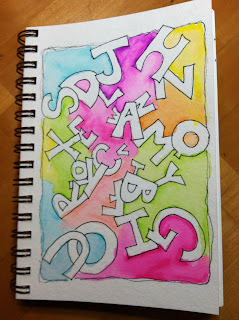 I am a little more than halfway through the Artful Lettering online class from Joanne Sharp. I have enjoyed her daily lessons. Admittedly I am not spending tons of time on them because I have other distractions. I am skipping some lessons entirely with the rationalization that I will go back and do them later (probably not). All in all, though, I like the class and I like her as an instructor. Here are 3 of the lessons that I have completed. 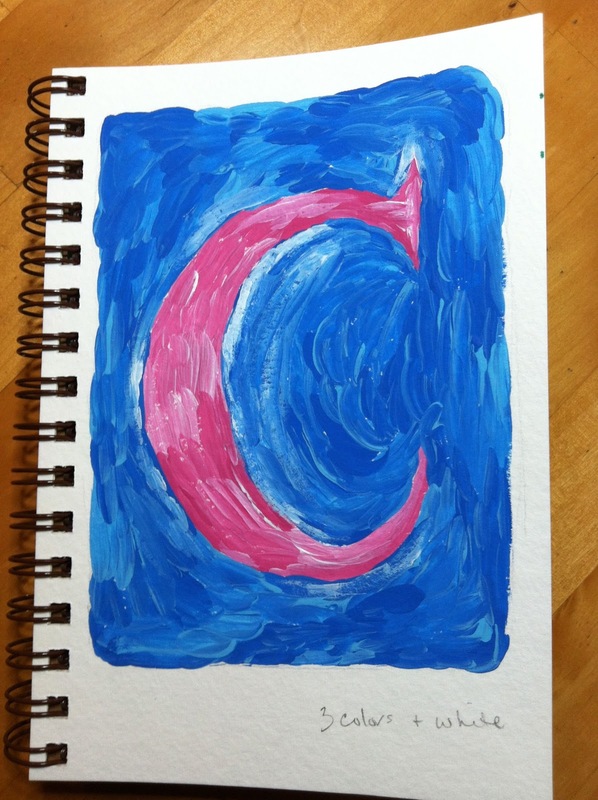 Joann calls this the "letter vortex." I think I should have added more letters, especially smaller ones toward the center, to give it more of a vortex look. I used my Tombow markers and it was good practice. I love the bright colors. 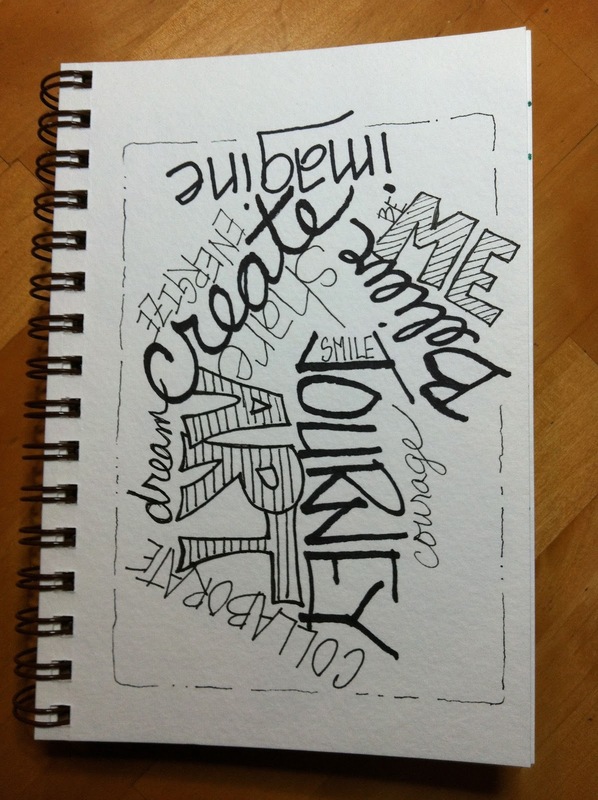 Who doesn't love a Word Cloud?? 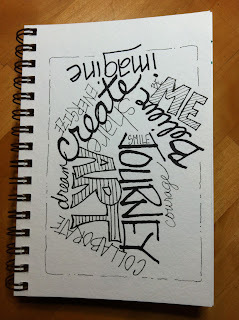 I make these all the time using the website Wordle but this is the first time I have made one by hand. I really like the way this turned out and I plan to make more of these. Joann suggests using the same color family so my next one will probably be all blues . . . or reds. . . fuchsia, maybe. . . . 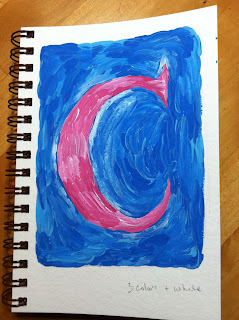 This lesson was all about creating a "masterpiece" using tiny brush strokes. I would like to repeat this a few times using different sized brushes and trying different degrees of blending the colors. It was difficult to know when to stop working on this piece. That's a problem I run into frequently. I'm not the only one who has that problem, right? These cards decorate my office. It's not that I love Valentine's Day or even the heart motif. I guess I like the idea of exploring the V Day card in multiple ways. Plus I like red. Most of these cards were made by my sister. I hope I get to add another one this year. I just started an online class called "Letter Love 201" offered by Joanne Sharpe. She is the queen of markers, as far as I am concerned. She knows everything there is to know about all varieties of markers and pens. 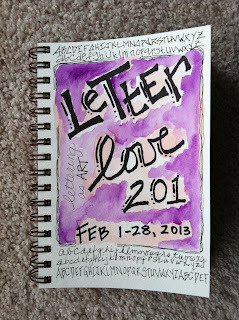 Along with her seemingly limitless knowledge, she also creates beautiful lettering, fonts, and alphabets. Check out Joanne's website called Whimspirations but beware! You will leave with an uncontrollable need to own more pens.